The hood blends well into the grille that houses the luxurious three-pointed star, with a rounder profile merging with the pulled back LED headlights along with a sloping roof line makes it look a lot younger, than the outgoing model. The Mercedes C-Class Coupe and Cabriolet models are also expected later in 2015, alongside an AMG model. The international versions of the C class are equipped with reversing camera, rain-sensing wipers, Attention Assist, Speedtronic cruise control, heated windscreen wiper washers, Tyre pressure monitoring system and Collision Prevention Assist Plus as standard. A drive select Select system with five driving modes – Comfort, Eco, Sport, Sport+ and Individual. The sports version is like;y to get more bells and whistle like 17-inch alloy wheels, LED headlights, lowered comfort suspension, chrome exterior trim. Similar strategy might be followed in India. 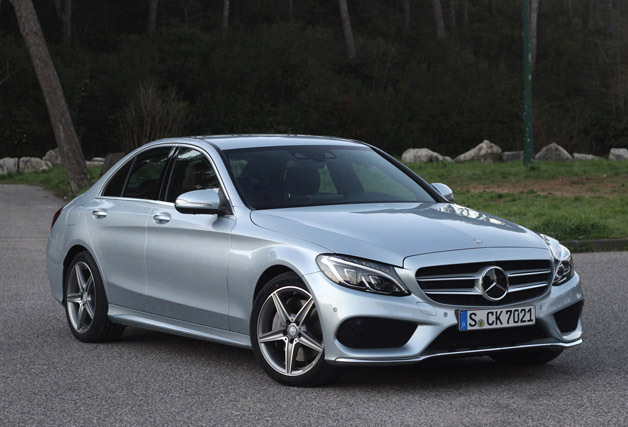 A C 220 CDI version and C 200 petrol engine have already landed on Indian shores for initial homologation.